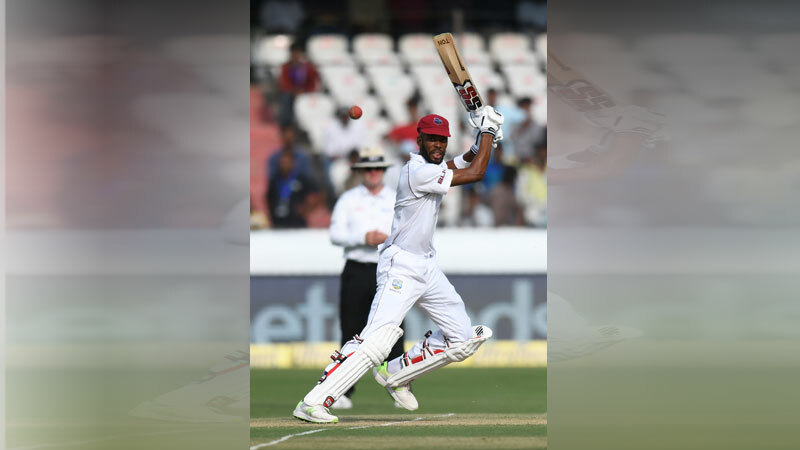 HYDERABAD Oct 12: Roston Chase hit an unbeaten 98 Friday to give the West Indies hope of setting a challenging total as they battle to level their Test series against India. The tourists were 295 for seven at stumps after electing to bat first in the second and final Test in Hyderabad. West Indies at times looked in trouble but Chase built crucial partnerships, including a 104-run seventh-wicket stand with skipper Jason Holder, who made 52. Chase was accompanied by Devendra Bishoo, on two, at the close of play. “Bishoo can score runs and keep his wicket intact. 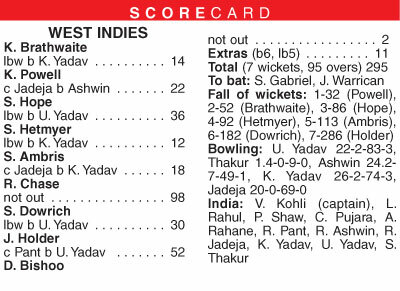 Ideally you’d look at the magic number of 400 in the first innings,” said West Indies coach Stuart Law. “350, 400 will be ideal for us and obviously the new ball with Shannon Gabriel, with his express pace, and Jason Holder back with his bounce and swing, we can get early breakthroughs and expose the middle order of India and put them under pressure.” But Law acknowledged that his team will “have to work our socks off to get to 350”. Umesh and spinner Kuldeep Yadav claimed three wickets each to rattle the West Indies middle order as the tourists slipped to 113-5 and then 182-6. But Chase kept his calm to counter attack with wicketkeeper-batsman Shane Dowrich in a 69-run sixth-wicket stand, as skipper Virat Kohli mixed and matched the Indian bowlers. “I think he understands spin. They face a lot of spin back in the Caribbean in domestic cricket,” said Law. “He has got a long reach, he takes half a stride and is there to the length of the crease. He uses that to his advantage, he is a clean striker of the ball.” India are a bowler short after debutant paceman Shardul Thakur suffered a groin injury in his second over and limped back to the pavilion. He was sent for scans and did not return to field. “Had Shardul been there, it would have been more help for the spinners. Like I got three wickets and if he could have chipped in with a couple,” said Umesh. “Actually when you are bowling with one fast bowler and three spinners, you finish overs quickly so the idea was to slow down the pace of the game a little bit,” he added. The morning session saw a fan run onto the field and embrace Kohli, who was clearly upset. The fan tried to plant a kiss on his cheek and take a selfie.